The BWRC hosted its second breakfast talk of the semester, “Making Wine on the Brooklyn Waterfront: Blending Community, Philanthropy and Education,” on Friday December 1st. The event was led by hospitality management professor Karen Goodlad, who also directs the campus-wide Living Lab initiative. Professor Goodlad moderated a lively panel discussion that highlighted the challenges and opportunities for winemaking in the heart of the city. Goodlad’s expertise on food and beverage management helped catalyze the focus of the breakfast talk – an innovative college partnership that connects City Tech students with wine producers at the Red Hook Winery. Joining the panel was Christopher Nicolson, a lead wine-maker at the Red Hook Winery. Nicolson educated the audience about the unique characteristics of Redhook Winery, namely its deep connections with local New York State farmers. Nicolson personally works with eight different small-scale grape producers on the North Fork of Long Island, as well as a host of other producers in the Finger Lakes region. The intimate connection between producer and winemakers allows the Redhook Winery to build a culture of camaraderie that is empowering a local production chain, anchored at the wine’s point of production in Red Hook. Nicolson also briefed the group on the winery’s recent history, focusing on the effects of Hurricane Sandy. After the storm destroyed a significant portion of the winery’s stock, community efforts enabled the winery to bounce back and build a more resilient business model. The partnership between City Tech and the winery proved crucial to the winery’s ability to sustain itself in the months after the devastating storm. 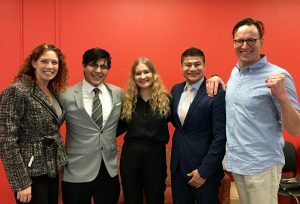 Hospitality students and panelists, Polina Savchenko, Roberto Burbano, and Renald Castillo also shared lively insights from their first-hand work experience in the wine-making partnership program. Throughout their independent study program, the City Tech students gained critical first-hand knowledge about the wine making process and New York’s unique viticulture. The semester-long adventure culminated with the production of two special label “City Tech” wines that were bottled and distributed to City Tech for it’s campus dining services. Both “City Tech” varietals – a red and a white wine — are served throughout the year in the Hospitality Management Department’s Janet Lefler Dining Room. If you would like to learn more about New York’s growing wine industry or how you can get involved, be sure to visit Red Hook Winery.